V. We adore Thee, etc. Consider how, after the death of our Lord, two of His disciples, Joseph and Nicodemus, took Him down from the Cross, and placed Him in the arms of His afflicted Mother, who received Him with unutterable tenderness, and pressed Him to her bosom. 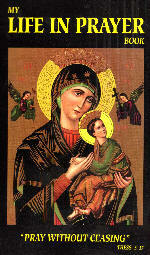 O Mother of Sorrows, for the love of this Son, accept me for thy servant, and pray to Him for me. And Thou, my Redeemer, since Thou hast died for me, permit me to love Thee; for I wish but Thee and nothing more. I love Thee, my Jesus, and I repent of having offended Thee. Never permit me to offend Thee again. Grant that I may love Thee always, and then do with me what Thou wilt. My Jesus, have mercy on the souls in Purgatory.